Kiribati is a group of islands in Micronesia, and very few tourists dare to go there. The islands had it rough in the past, and the area is poor. However, once you get there, you will be left awestruck. The islands do not even begin to compare with your usual tropical paradises. The beaches are stunning. It is like someone made a collage from magazines. The superb white sand and the turquoise water will make you want to stay in it all day long. The 33 atolls are perfect for walking or biking. Plus, you can dive and see the coral reefs, snorkeling is fantastic, and you can surf if you know how. The people in Kiribati are not used to tourists as much as in other places, but they are incredibly friendly, and if they are having a party and see you walk by, you are invited to join. But before you travel to Kiribati, you should know that you may be required to get a visa before departure. According to Kiribati’s visa policy, there are 72 countries and territories whose nationals can travel to Kiribati without a visa. The amount of time they can stay in Kiribati varies from 30 days to 4 months, depending on the nationality. The rest of the travelers from around the world need to apply for a visa before departure. 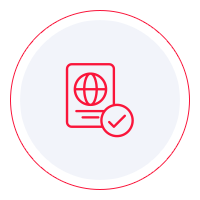 If you want to find out whether or not you need a Kiribati visa, you can look for the information online, but we suggest using the Visa Checker. It is a simple and easy to use tool. You must select your country of origin from the drag-down menu on the left and put Kiribati as your destination on the right. If you are not required to get a Kiribati visa, you are good to go, but if you do, the Visa Checker gives you a list of embassies that are near you. Keep in mind that Kiribati does not have diplomatic missions in all countries. In Asia, for example, the embassy is located in Taipei, Taiwan. iVisa does not process Kiribati visa applications at the moment because electronic visas are not available, but as soon as they become available, we will do our best to help you get one. Until then, all we can provide is information, which is why we put our support service to your disposal 24/7. Before going to the diplomatic mission of Kiribati to apply for your visa, you must read about the requirements. You can find a lot of information online, although we recommend that you contact the embassy itself and ask your questions there. The information online is not always the most reliable, and you do not want to waste time going back and forth to the embassy. Nevertheless, what we can tell you is that you need to have a valid passport that does not expire for another 6 months from the date of arrival in Kiribati. For further information, contact the diplomatic mission. While we cannot help with the Kiribati visa application itself, we hope that the information above is useful.